The makers of Such Is Life: The Troubled Times of Ben Cousins have crafted an excellent documentary film unprecedented in the world of Australian professional sport. Characterised by frank talking head interviews with sport and media professionals who charted Cousins' rise and fall; with those who worked with, above and around him at football clubs the West Coast Eagles and Richmond Tigers; with friends and family and with the charismatic Cousins himself, Such is Life offers a brutal insight into the pressures of Australian sporting celebrity, and penetrates deeply into the private battles of an individual who has been as obsessive in his pursuit of on-field excellence as in his recreational substance binges. Complaints that the documentary downplays the downside of drug use are misguided. There's footage of a drugged-up Cousins twitching in his kitcken; looking physically wasted while detoxing at a friend's property in Cottesloe; emotional anecdotes from his family about witnessing their beloved Ben's self-destructive behaviour; distressing audio from a 911 call made after Cousins had been on a five-day cocaine binge in the US. Not to mention his dramatic, devastating fall from grace at the Eagles, where he lost first his captaincy, then his place at the club, after having been an inspirational superstar for 238 games; and recollections of the death in October 2007 of Cousins' 'great mate', former fellow Eagle Chris Mainwaring, of a drug overdose. These are real consequences. Such Is Life is a film with a powerful, implicit moral to communicate. In being broadcast on a commercial network, what Such is Life gains in exposure it loses in momentum. To its credit, Channel Seven kept the commercial breaks in last night's broadcast to a minimum, and even these were flanked with promos for addict support services, in keeping with the film's cautionary tone. Yet one of the film's strengths is its relentlessness. We are drawn with Cousins to the compulsive limits of physical training and the pursuit of perfection, to the vertiginous heights of fame, to the joyous, frightening maelstrom of drug use, to the pits of public shame and on towards the arc of redemption. The commercial breaks, a necessary evil in this medium, nonetheless damage the integrity of this empathetic experience. On the other hand, the decision to cleave the film in two and screen it over successive nights can only be described as a cynical ratings grab. That statement is not disproved by the fact that part two will be married to a televised discussion forum. This seems to be more an attempt to build hype around a televised product, rather than a serious attempt to understand the core issues. It is disappointing to see Seven take this route. Few would deny that whatever his wrongdoings, Cousins has, like a drug, been used and abused by the media. That's a central theme of Such is Life, underscored by Cousins' bewilderment at returning from a stint in rehab to find his personal struggle had been made a public issue, fair game for anyone with a soap box to mount or an axe to grind. It is unlikely that this treatment did anything other than exacerbate the problem. The mistreatment continues. Cousins is no angel, but neither is he a demon; just a man with a problem that he's fought to contain. His story has mirrors in the lives of many people who have battled addiction. Seven's treatment of it borders on exploitative. Tim Kroenert is Assistant Editor of Eureka Street. He is a contributor to Inside Film and The Big Issue magazines, and his articles and reviews have appeared in Melbourne's The Age and Brisbane's Courier-Mail. He was Chair of the Interfaith Jury at the 2009 St George Brisbane International Film Festival. Spot on about Channel 7, Tim. It's interesting that Ben attracts people. Despite his ego, a prerequisite for top sports people, he's a charmer, rather like Peter Pan. Thank you for your commentary. I worked in D & A for 20 yrs and was working with people from 18 to 70+. My eldest daughter used heroin with her husband when she was 19 until 35 when her husband died of HIV and which she is really battling with now. I never understate the cost of A & A dependence but most people are now criminals and I am sad at how they are spoken abut by politicians and the media. Many of the people I worked with were professionals, no stealing to pay for their habit, but having a less than good lifestyle because money was going on dope. 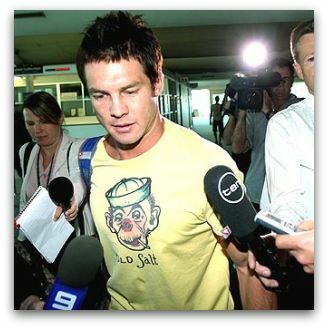 Thank you again and thank you to Ben Cousins. My da who was raped and lost a baby 20 years ago was asked to go on 60 mins with a money offer. She refused and is in poor health but is a resourceful woman and she and I are best friends because we both had to deal frankly with the problem. I could only be Mum, the professional medicos and counsellors helped her to deal with the loss of her husband and to not use drugs again. To believe the film, there are only two things in this man's life: football and drugs. There isn't anything else. Yet most of the interviewees and commentators treat football with unquestioning obsession, unable to see that this is part of the problem. The only person in the film to offer a solution was the family friend at the surf beach. He says that Ben has to learn to give, not just receive the whole time. He even used the word 'spiritual', Ben needs to find a spiritual life. Are we hearing that from his family, the sporties, or even his counsellors? Tim is right to point out that this is a film, not just some TV promotion, and cut through with ads and anchormen who believe in tweets. Mick Harvey's soundtrack was expertly arranged to imitate the rush and withdrawal that Cousins must experience, whether on the field or with his drug of choice. But its momentum, like that of the carefully positioned interviews with Cousins, was lost on a commercial station. Cousins has played out a unique role in AFL, but there was one other issue quite ignored in this film: these people have access to a lot of money. I agree with you Phil. The surfer guy was the only one who spoke sense. Here is a young man unable to inspire himself away from the spotlight and 'a routine' and they give him a national tv show thinking that will help? My 16 year old son... not a young man of many words... came home from school the day after the first part of this special and said, "the guys at school reckon he (Cousins) made drug use look o.k., because he was still able to be a successful footy player for so long." He also said that the program showed how to use lots of different drugs. Useful information for kids wanting to explore drugs. I agree! And I am happy to find this sentiment expressed publicly by you after being shocked (perhaps naively so) at the backlash against this documentary, that I thought was powerful and genuine, and in no way glamorized drugs. Soundless as snow .. the leopard comes, .. all of his weight .. is in the gold of his predatory eyes ... behind the heavy, protecting glass ... eternally deprived of prey. 'Anyone watching this saying it in some way supports or encourages violence is watching the film in a very perverse way.' UK filmmaker Michael Winterbottom has a point, but one must wonder what scenes of brutal violence against women contribute to the betterment of the public imagination.